The European Rubik's Cube Championship 2008 is the 3rd European Championship and will take place on September 19/20/21, 2008 in Derio (Bilbao), Spain. Derio is a suburb of Bilbao. The greater Bilbao area is an area with plenty of charisma and personality, traditional and avantgarde at once, with a cosmopolitan and gentle feel, and rich in cultural and gastronomical offerings. During the competition weekend there will be several other events in Derio, because of the 350th anniversary of the village. 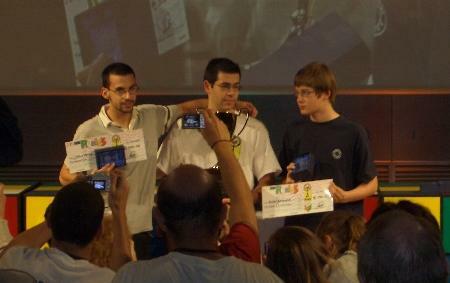 European Rubik's Cube Championship 2008 is an official competition of the World Cube Association. Saturday: preliminary rounds for main events, finals for some side events. Sunday: finals, winner's ceremony, after party. The European Rubik's Cube Championship is open to competitors from all countries of all ages. For each event only the best competitors from Europe and Israel are eligible for the official European Championship titles. Competing at the European Championship is free. All competitors receive a gift pack. If you have any questions, feel free to contact the Euro 2008 organisation team. September 16, 2008 Weather forecast for the weekend: sunny with clouds, temperature 21-23 degrees. September 16, 2008 There is no waiting list anymore for Rubik's Cube Fewest moves event. September 15, 2008 A newsletter was sent to all registered competitors of Euro 2008. If you did not receive the newsletter by e-mail, then please contact the Euro 2008 organisation team. September 15, 2008 There is no waiting list anymore for Rubik's Cube Multiple blindfolded event. September 14, 2008 Update of the provisional time schedule. September 4, 2008 Promotional video. September 2, 2008 Rubik's Cube Fewest Moves event is now planned on Saturday morning at 09:00. September 2, 2008 Update of the provisional time schedule. September 1, 2008 Qualification times are now finalised for each event. Only 2 events still have a waiting list: Rubik's Cube Multiple Blindfolded and Rubik's Cube Fewest Moves. August 31, 2008 No qualification round for Rubik's Cube Blindfolded. All competitors compete in first round. August 31, 2008 Qualification period has finished. All times on current world ranking (August 31, 2008) are taken to decide which competitors go straight to first round/final. Other competitors need to compete in qualification round or are placed on waiting list. August 9, 2008 An update of the waiting lists is expected on September 1, when the qualification times period closes (August 31). August 7, 2008 Prize information is now available on the Events page. Small update to Friday's and Sunday's time schedule. May 27, 2008 Changes to time schedule. Events start (and end) later on Friday to enable more people to arrive on Friday. May 22, 2008 Added local bus information to the Travel page. May 22, 2008 Added youth hostel information to the Hotels page. May 20, 2008 Registration for Euro 2008 has opened.